VeriFone Systems this morning announced a deal with electronic payments giant PayPal that sounds like bad news for Twitter inventor Jack Dorsey‘s latest venture, Square. VeriFone, which offers solutions that enable electronic payment transactions and related services at points of sale, will extend mobile payments acceptance with PayPal and integrate traditional card payments with its new partner’s Mobile Payments products. In addition, PayPal Mobile App will soon work with VeriFone’s PAYware Mobile for iPhone (which is the product Square competes with, as it also enables merchants to accept payments via a software-hardware combo for the Apple smartphone). Furthermore, the PAYware Mobile App will be enhanced to support PayPal Bump technology that enables iPhone users to bump their phones together to transfer money between them. VeriFone will, upon integration, promote PayPal and Bump acceptance to its reseller channel. 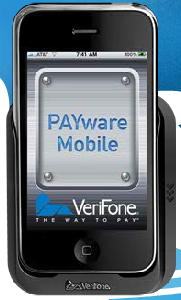 PayPal, in turn, will co-market VeriFone’s PAYware Mobile to its own user base. The integrated capabilities are expected to be available next year.